For the longest time, Martha Stewart has been an idol of mine. Her successful entrepreneurial spirit and love for simple yet delicious cooking is all I’m looking for in a career role model. Naturally, I subscribe to Martha Stewart Living, her monthly publication. Its arrival month after month puts me in a state of utopia simply thinking about the domestic wisdom this goddess chooses to bestow on her readers. So it pains me to write that she and her staff made a slight misstep in the October issue which featured a spot on coconut oil, highlighting its ‘benefits’ and uses. The article includes recipes for a smoothie, soup, scallops, and chocolate bark. It’s soaring in popularity – and well on its way to becoming a kitchen stable. After all, it’s as rich as butter (without the cholesterol) and as versatile as vegetable oil. Grocery stores now stock the good stuff…and it’s a wonderful vegan substitute for butter in baked goods. Shoot girl – this the not the promotion coconut oil deserves, despite how popular it may be. To me, it is the equivalent for promoting bacon for its health benefits. Coconut oil, be it ‘refined’ or ‘virgin’, contains more saturated fat than butter. One tablespoon of this solid fat contains 117 calories, nearly 12 grams of saturated fat and less than one gram of monounsaturated fat. You want to limit your saturated fat consumption because it raises the level of cholesterol in your blood. The mono- and polyunsaturated fats are the ‘healthy fats’. Found in plant-based foods, these fats help to lower your LDL cholesterol (the bad cholesterol). The American Heart association recommends limiting your saturated fat consumption to 5-6% of your daily calories. 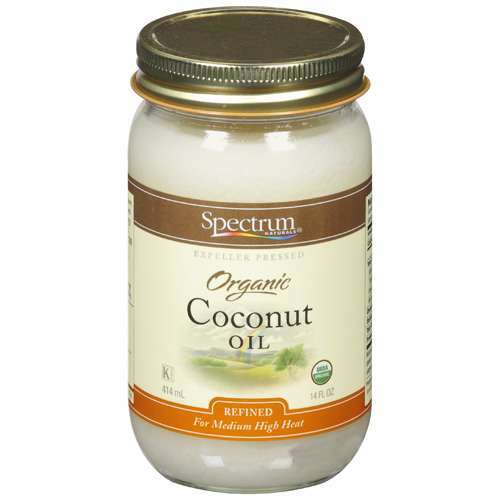 Bottom line: if you MUST have your coconut oil, reach for the virgin coconut oil. It’s high in lauric acid, a medium chain fatty acid found in the saturated fat family, which has been shown to raise both your good and bad cholesterol levels. If I were you, I’d stick the olive, canola or avocado oils. ← I’ve Got Two Pickles Today! Hey Hey!